Share this e-card with the mothers in your life and thank them for the vital work they do ensuring our children and communities are informed participants in our democracy. 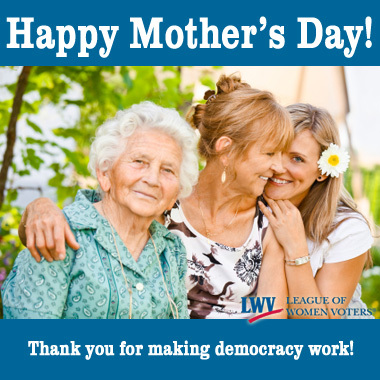 This Mother’s Day, I’m joining with the League of Women Voters and thanking the mothers I know who are committed to making democracy work. It is no small task to raise informed and active citizens and to be an engaged member of our community! Mothers play a vital role in raising educated voters. The League of Women Voters was founded over 90 years ago because women play a special role in ensuring the public welfare. Through their commitment and dedication to woman’s suffrage, they forever altered our American democracy. Over the years, women and mothers have continued to play an essential role in our political system. Through their tutelage, new citizens and voters learned what an engaged citizenry could accomplish. But as the old adage states, a woman’s work is never done. Through our shared commitment to an informed public, the League often relies on mothers to organize and educate others on important issues, so that voters can make their own decisions and participate in our democracy. Happy Mother’s Day and thanks for helping make democracy work!